Sure, sure, sure…there are a fair share of cute and curly puppies out there, especially as more designer breeds are created. At Furry Babies, however, we’ve got the original! We have purebred Poodle puppies for sale. Our little pups are so sweet and charming. Want to learn more about our perfect pooches? Continue reading! For starters, you should know that Furry Babies only gets our puppies from only the most caring, reputable breeders in the country. This is our standard practice, whether we’re talking about our Poodle puppies for sale or our Labrador Retrievers. We only conduct business with breeders whose breeding practices we stand by proudly and publicly. Why are our Poodle puppies so special? Our furry babies are special because we place an enormous focus on ensuring each baby puppy gets the best individual attention and love while they’re in our care and before they go to their new homes. Before coming to our stores, all of our Poodle puppies for sale receive a minimum of two health and wellness checks to make sure they are feeling their best. We take lovingly take care of our puppies to ensure they’re happy and healthy. What makes Poodles so special? People who purchase our Poodle puppies for sale often have allergies to dogs, but Poodles are one of the safest puppy purchases to make. 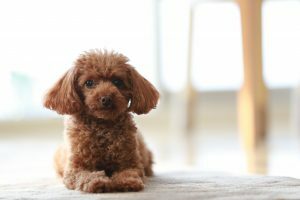 They are considered to be as hypoallergenic as dogs come because they don’t shed much and produce very little dander. As we mentioned earlier, there is a rise in designer breed dogs and Poodles are the base of most mixed breeds (of all sizes), for this reason. In addition to being hypoallergenic, Poodles are downright geniuses. They are one of the smartest dog breeds, which makes house and obedience training a breeze! They retain commands and skills fairly quickly so get ready for some training fun. Have you been convinced or was it an easy choice? We have Poodle puppies for sale in our store and they’re waiting for you. If you’re concerned about pricing, don’t worry. We have financing options whereby the decision can be received in minutes. You’ll be in and out the door in no time! Give us a call to get started or feel free to contact us via our website at https://furrybabiesinc.com/contact-us/.